10 reasons to hire a campervan for a festival in Ireland! Most likely, you won’t have access to electricity on festival camping grounds. However a fully equipped campervan is completely self sufficient so you will have lights, fridge, shower and cooking facilities without the need for mains electricity! Basically everything you need to make the most of your festival experience, from hot water to cold beers! 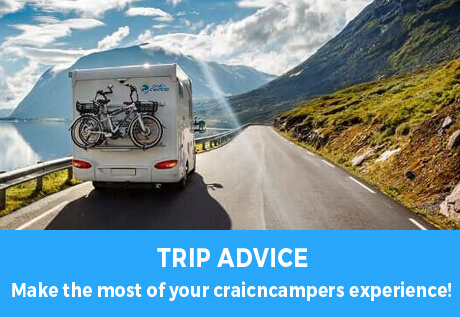 By travelling via campervan, you don’t have to worry about parking and then having to set up camp somewhere else. You can be sure of a camping space with your campervan ticket so no need to rush there just so you can get the best camping spot! This also saves time if you do need to retrieve some of your belongings or get changed during the day etc. You have everything you need in the one place and won’t need to move between your car, tent and the festival itself! There is a lot to be said for having your own private shower that you can avail of without queuing and that you can rely on the water being hot! You have privacy in the campervan and don’t have to rush in the morning to be first in line for a shower! Do I even need to explain why?! While it’s not practical to rush back to the campervan to use the toilet all the time during the day, it makes a huge difference not having to scramble around in the middle of the night to find the nearest portaloo! You have facilities onboard to have breakfast or cook should you wish. Food and drinks at festivals can be expensive and not very appealing! At the very least you can bring snacks that can be stored safe and dry and drinks can be kept cold in the fridge. You get to sleep in an actual bed and not on the ground! While sleeping might be the last thing on your mind when planning to go to a festival, at some stage you might need to recharge your batteries! You can be sure of a decent night’s sleep or at the very least a decent power nap! No assembly required! Save all the arguments with your friends and families that naturally occur when its time to construct the tent. Typically it will start raining just as you are about to start and lets not even think about when the time comes to take it down! It is the last thing you want to face after the weekend, it just adds to the post festival blues! With a campervan you just park up and you’re ready to go! You can keep all your belongings locked in the campervan and not have to worry about them! It is unfortunate that this should be one of the reasons to rent a campervan, however sometimes things can be stolen. With a campervan you can enjoy the festival safe in the knowledge that your belongings are securely locked away. You can be assured of staying warm and dry in a campervan, at the very least while sleeping! No threat of soggy tents or sleeping bags that will resort you to sleeping in your car! One of the most common problems with a warm dry base is friends from washed out tents looking to join you! The experience of a campervan is like no other, it’s a home away from home! The atmosphere on the campsite is always good fun too! You have space to carry a table and chairs with you so you can sit outside in the morning and eat and drink while you wait for the music to start! 10 Campsites in Ireland Recommended by CNC customers! Top Festive Christmas Markets in Ireland! Recommended activities happening over the October mid-term break in Ireland! !